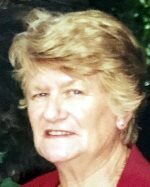 Family and friends of the late Mrs Anne Maher are invited to attend the celebration of her life which will be held at Glenmorus Chapel, Glenmorus Gardens Cemetery, Union Rd, Albury, on Wednesday 16th May 2018, commencing at 2pm. A burial service will follow in the adjacent cemetery. Passed away peacefully at Mercy Hospital. Loved wife of Peter (dec). Adored mother of Pat, Tom, Colleen, Roslyn (dec), and Danny. Granny to many. Now is your time to soar with the eagles. Deepest sympathy to all the family. Prayers and thoughts are with you all. Irene & Eric and family.